Foreword. Preface. Organizing Committees. Acknowledgements. Plenary Lectures. Control of Catalyst Performance in Selective Oxidation of Light Hydrocarbons: Catalyst Design and Operational Conditions (B. Delmon et al.). Vanadium Resistant Fluid Cracking Catalysts (M.L. Occelli). Metal Clusters in Zeolites: Nearly Molecular Catalysts for Hydrocarbon Conversion (B.C. Gates). Catalyst Deactivation (D.L. Trimm). Preparation and Catalysis of Highly Dispersed Metal Sulfide Catalysts for Hydrodesulfurization (Y. Okamoto). New Developments in Olefin Polymerization with Metallocene Catalysts (W. Kaminsky, A. Duch). Sessions. Hydroprocessing of Petroleum Residues and Distillates (20 papers). Fluid Catalytic Cracking (6 papers). Oxidation Catalysis (7 papers). Aromatization and Polymerization Catalysis (9 papers). Catalyst Characterization and Performance (6 papers). List of participants. Author Index. 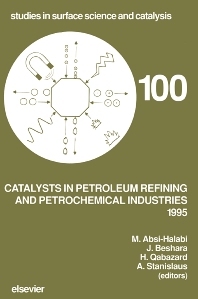 Catalysis plays an increasingly critical role in modern petroleum refining and basic petrochemical industries as market demands for and specifications of petroleum and petrochemical products are continuously changing. As we enter the 21st century, new challenges for catalysis science and technology are anticipated in almost every field. Particularly, better utilization of petroleum resources and demands for cleaner transportation fuels are major items. It was against this background that the 2nd International Conference on Catalysts in Petroleum Refining and Petrochemical Industries was organized. The conference was attended by around 300 specialists in the catalysis field from both academia and industry from over 30 countries. It provided a forum for the exchange of ideas between scientists and engineers from the region with their counterparts from industrialized countries. The papers from the conference, which were carefully selected from around 100 submissions, were refereed in terms of scientific and technical content and format in accordance with internationally accepted standards. They comprise a mix of reviews providing an overview of selected areas, original fundamental research results, and industrial experiences.